After teaching my students about Howard Gardener’s Multiple Intelligence Theory, I wanted them to imagine they were a preschool teacher and had to develop activities around a particular children’s theme, incorporating each of the 8 multiple intelligences. After randomly selecting a theme, students create a theme board to share their ideas. In addition, students must explain how each of the activities selected relates to the multiple intelligence they’ve partnered it with. If your students are actually teaching in pre-school programs, this would be a great planning tool for them to utilize. Note: Prior to assigning this project, students would have learned about Howard Gardner’s Multiple Intelligence Theory via this lesson on Multiple Intelligences. Introduce the assignment and show students a sample. 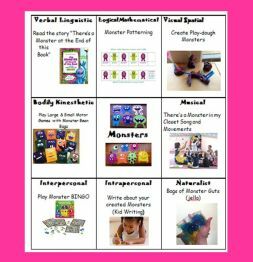 I project a sample onto my screen, using the monster theme and the activities used in the original lesson as I’m discussing the project. Students randomly select a theme from the list of options and utilize online resources for activities relating to each intelligence. I encourage students to use Pinterest, and The Perpetual Preschool site for ideas. Students create grids electronically, inserting activities, pictures and hyperlinks for each activity. If doing this on an iPad, Google Slides works best for creating the grids. In addition to creating the theme board of activities, students must also explain how their chosen activity relates to the intelligence they paired it with. I plan to utilize your Multiple Intelligence theme board project idea using a Pinterest board – similar to your children's storybook project. Then I think I will have each student create one of their pinned ideas if time permits.